it’s certainly a bonus when the moon is full and the stars are bright, but don’t count on just natural light or even standard indoor lighting alone to brighten a reception. Lighting should be both practical and magical. 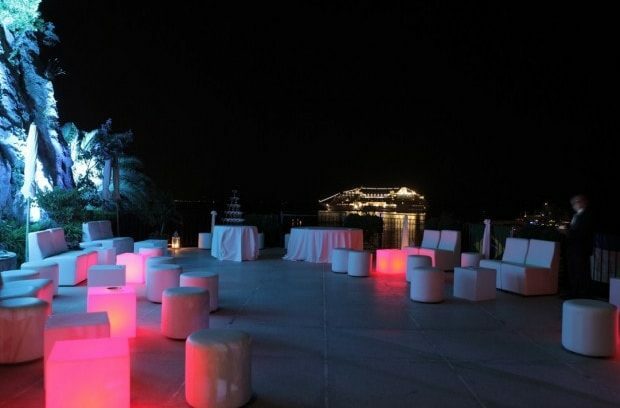 When a party is held outdoors, paths must be marked, lights need to be placed at floor level so no one trips, bar, tables and buffet must be illuminated so guests can see the food, and ambient and spot lighting of just the right tone and intensity must be adjusted so everybody will look their best. Lighting also subliminally influences the sound level. Bright lights encourage chatter and noise, soft lights and candlelight call for whispers and romance. Some party lighting is purely decorative: a hearth-shaped wreath outlined in fairy lights, for example, or borrowed scenery that doesn’t illuminate, but does decorate. John and Lisa paid a great attention to the light decorations of the amazing venue in Amalfi overlooking the ocean where they had their wedding reception. Not every wedding is so spectacularly decorated, but where the light of the sunset and the scenery of the sea act as backdrop of a wedding will make it memorable. Sunsets and moonlight are free, and any reception can be scheduled for the most beautiful time of the day. We always suggest to schedule the timing of the wedding day to enjoy either the sun-light and the sunset on the amazing Amalfi coast.